The creation of art can be a wonderful and dreadful process at the same time. Some of the struggles I’ve encountered with my chosen art form of writing include writer’s block, doubts and fears regarding my abilities, the evil query and rejection letters, comparison, envy, impatience, and the list goes on and on. But every now and then, there are lamps along the tunnel as I travel toward the light at the end. That’s when it’s wonderful. As an outlet for my frustration, I began to tag along with my sister-in-law when she took photographs. She’s really quite good and a patient teacher as well when I asked her questions on how she approached her shot. One of the ways she explained the process was to hand the camera to me. I declined the opportunity to even hold her camera, which looked far too technical and expensive, but in addition to being a great teacher, my sister-in-law is mildly insistent. There was no way I was getting off the hook. So, I snapped a few pictures as she taught me what the various dials and buttons on the camera do. She talked me through the procedure, and by allowing me to make mistakes, I learned quite a bit and became addicted to photography. Here’s where the wonderful part happened. After setting up an account on ViewBug for my photos, joining challenges, and voting on other peoples’ pictures, I earned a free tutorial on landscape photography. Even though I don’t own a camera, I watched the video with the hopes of gaining more knowledge and possibly impressing my sister-in-law. The lesson on photography will help me hone my skill, but what truly impressed me was how much of what the instructor said could be applied to writing. For starters, new experiences are good for you. Even if you’ve been writing for a while, keep in mind that every time you start a new piece, you’re taking yourself someplace you’ve never been with a different location, characters, style, descriptions, etc. And even if you’re working on a series, you have the power to make something new happen each time. Then there is your unique perspective. You are going to see things differently than anyone else in the world, so write them from the perspective that you alone possess. As for equipment, writers have the luxury of keeping it simple, and I strongly suggest you do. A well-sharpened pencil and single-subject, college ruled notebook is all you need to create literary brilliance. Know the basics and fundamentals of your technique. Scouting a good location is important for a writer because distractions, even in the home, will keep you from your goal. Timing is important for the same reason: determine when in your day you are the most productive and stick to the schedule. And when it comes to composition, that’s where your personal style will shine through. So now it’s time to address your process. The instructor on the tutorial called it a mind process and used words every writer knows. He started with subject. Identify what deserves to be written. Don’t forget POV. Take a small bit of advice from a photographer, and don’t be afraid to explore multiple POVs at the same time. What it does for photography will not be lost on writing. The formula for determining exposure translates into plotting, pantsing, or a combination thereof for a writer. Again, don’t be afraid to experiment. Next, decide what you’d like to focus on. Once all of this is determined, work that composition. When you show your photographs to other people, they don’t know what else is going on around the scene you’ve captured or how you felt when you took it. Writers can combat this issue by providing essential backstory at the appropriate time. But just like a photographer, you don’t have to show it all. Leave a little mystery, a little something to the imagination, and your reader won’t feel led around by the nose. Write about the most interesting parts because that’s where the story is, and you’ll capture a good picture. A mental picture in this case. Remember that the objective is not to capture one big picture of everything all at once, but rather a frame that tells a clear story. You are the director, you choose the content. Don’t fall in love with the first thing you write. Investigate your characters’ surroundings and discover what else you can do with it or them. Walk through their world. Return many times with breaks in between. Take another look at your subject, and decide what else you can do with it. Then apply your creative style in a way no one else has thought of. Add vibrant but well-written details and structure, and a sense of order will emerge. You can do this on different levels of your writing whether writing on a grand scale, intimate stories, or the minute particulars. Keep in mind that your ideal and the reality won’t always match, but don’t let this discourage you. Work with what you’re given, seek inspiration, and the great story will come. As for filters, they apply to the writer during the editing stage. You’ll be able to filter out the bad in your own writing after you’ve set it aside for a couple months and return to it fresh. Beta readers provide some of the best filtering toward your writing goal, seeing things you didn’t, and offering advice from their own perspective. With a few modifications, the guidelines for taking a great photograph apply to writing with stunning clarity. I mentioned this at my writer’s group and was told by a poet that this is known as the rules of the creatives. They are a set of standards that transcend one artistic form to positively influence another. Hanging with the poets a couple of times a year has already lent valuable insight to my writing. Imagine how thrilled I was to discover that my newfound hobby would as well. There are so many artistic pursuits that crossover to supply inspiration and encouragement. Already I’m viewing the story ingredients in my mind and trying to figure a way to bake them all together so as to produce a perfect word painting. I suggest you do the same. Excellent post, Heather. Having been involved with photography from an early age, I can attest to the similarities as you have described them. Thank you for that validation, Mark! I truly appreciate that. God bless! 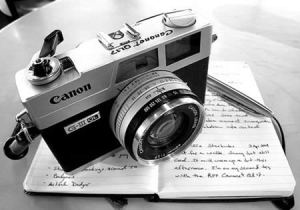 Thank you for this clever and informative post showing writing seriously and photography can be analogies for each other. You’re welcome. I’m glad you enjoyed reading it.